This will be the first in a series. I want to document as I go. I know that you will agree when I say that people tell me I am nuts to be concerned with a kitchen in a rental apartment. My response to this is that I have to live with this kitchen every day just as any homeowner does. I am doing as much of it myself as I possibly can. I have employed the help of a few friends and neighbors as well. My kitchen is attached to the living/dining area. So I do not have the luxury of closing a door to avoid it. I do like the fact that I can be cooking or doing dishes a still be in the same room with my girls. Here is what we are starting with. As you can see, I am playing around with color, which I do quite a bit more than a normal person :). My kids' joke is that they go to bed and the apt is one color. When they awaken it is a completely different hue. I understand that this is nice wood. I can appreciate that. But if you know me or have even read my blog once you are aware that it is just not my style. I was not planning for these pics to be before shots so please excuse the mess as well as poor quality on the one below. This is the view from the living/dining room. So I started out by painting the walls. They are better than the chiffon yellow but I am not that happy with the color I chose. I may change that, but that is pretty easy since the room is tiny. Then I moved on to the cabinets. This proved to be the most difficult part by far. If I actually dragged you through all of the hideous details you may cry, so let's not risk that. I did not do an outstanding job at all. But in my opinion, it is a vast improvement. I painted them white and added new stainless steel looking hardware. I know also that hardware can be terribly costly. I went to Home Depot and found these very simple and affordable hinges. Eventually I would like to add picture frame moulding to the cabinets. But for now this is just fine. 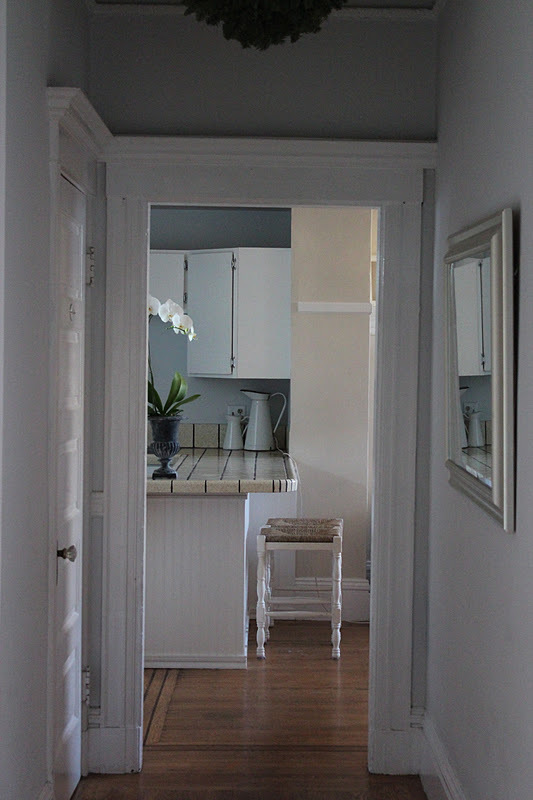 I then added wainscoting to the underside of the kitchen counter. 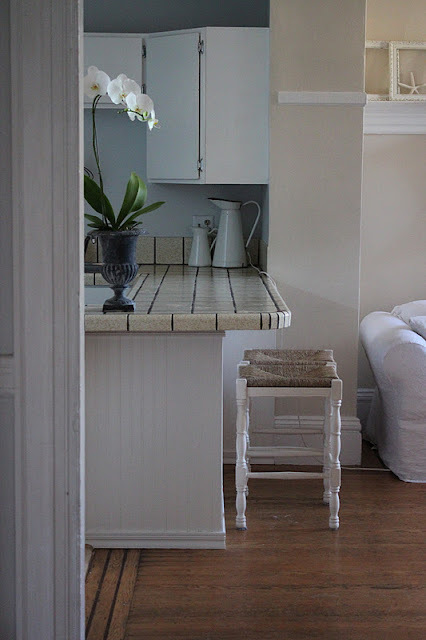 I painted it a shade of white that I am pretty happy with called Mountain Peak White by Benjamin Moore, same color as the cabinets. It took quite a few coats of paint, and could probably stand to have a few more. But the difference it made to the room visually cannot be overstated! So, the next step is the lighting. Here is what is currently in place. And here is the photo from Mothology in New York for the pendants which I am replacing these beauties with. My stepfather is making the "box" from which they will hang and will bring it to me in February when he and my mom visit next. Cannot wait! They were sold out of the far left one. I had hoped for one of those and two of the hobnail, or center ones. So, impatient as I can be, I chose three of the latter. Aren't they beautiful? I love that mercury glass is dubbed "poor man's silver." The next step will be the most glaring offense, the countertops. I have chosen oak. I like the feel of butcher block. But I am especially drawn to the darker color of oak. I need to do a bit more research, and saving of funds ;) for this part but I have plenty to do in the meantime. And in a perfect world I would like an apron sink. This is not a one week project...or even one month. I am enjoying the process as opposed to rushing to the finish line. Isn't that the point? Oh...Michele...I am amazed. I want to grab a brush and paint our cabinets! Your pendant lamps...pure art! Your post is so inspiring! 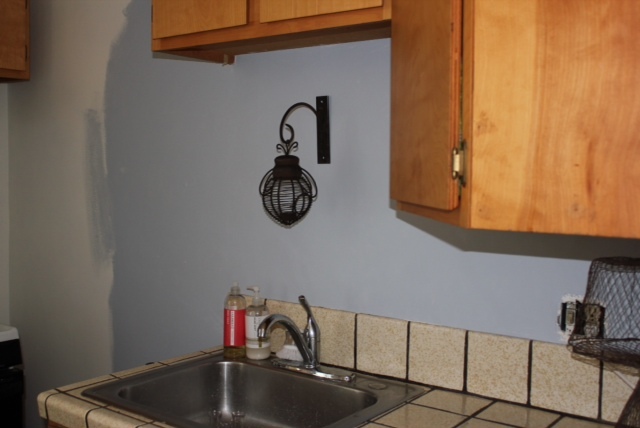 You are fortunate that your landlord will allow you to paint the cabinets. However, it is your landlord that is most fortunate to have you as a renter! You are taking the ordinary and making it extraordinary! Bravo! thanks ladies. I appreciate your comments. 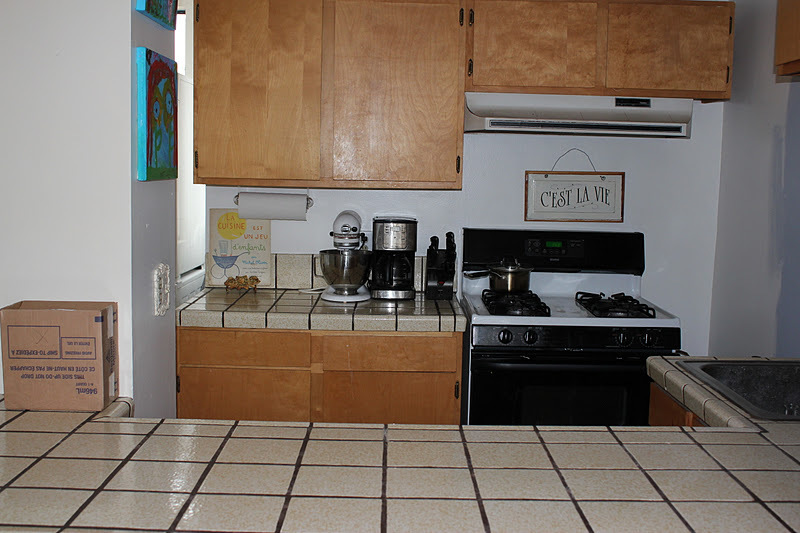 I am looking at the ikea sink as well as their wood countertops. And I have lovely landlords who are happy to allow me to fix it up. 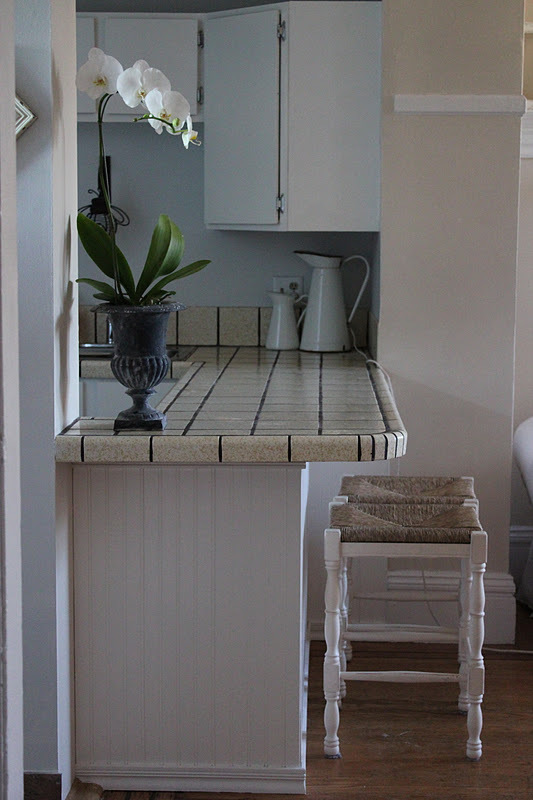 I never thought about the countertops blending with the stools and the baskets but that is a good point. I will repost in Feb as soon as I get the pendants up. have a great day and thanks for taking the time to stop by and give me some feedback. First of all, Michelle, I'm amazed in an apartment you were allowed to paint the cabinets, nice landlords! Second, isn't it amazing what a little paint will do? It looks sooooooooo much better! We moved into a similar looking kitchen in our home, and my husband painted the cabinets white and added nickle hardware and the change literally brightened my spirits every time I walk into it. I love what you've done so far, and the little peek into the rest of your home looks wonderful! WOW! You go girl, this is quite the transformation and I'm sure your landlord is LOVING you! Good for you for taking it on in a rental, how we feel about our spaces makes a huge impact upon our well being. Saw your pics in houzz....very nice! I would love to paint mine ad well but have heard horror stories...is it really hard?? Thanks for coming to my blog! Following you too now~and happy to see you painted the cabs. I painted all mine too!! 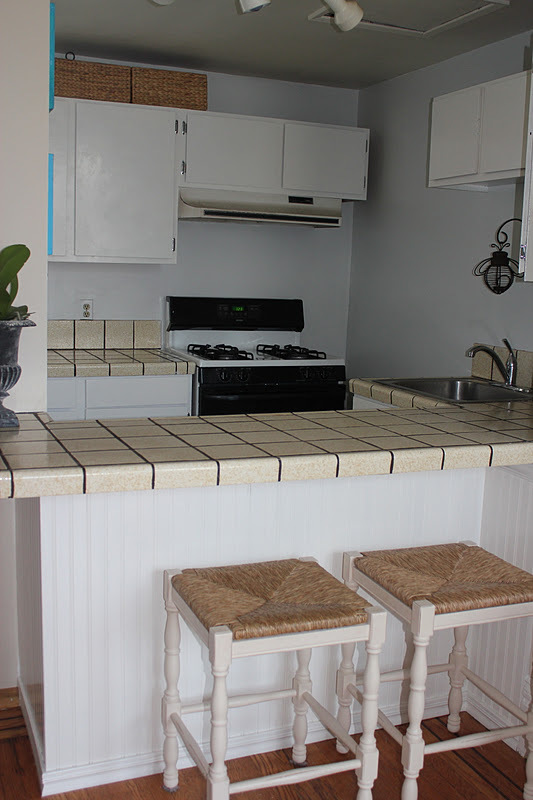 What a difference, rental or not, you gotta do what makes it liveable feel nice. Wow! what a difference...!!! 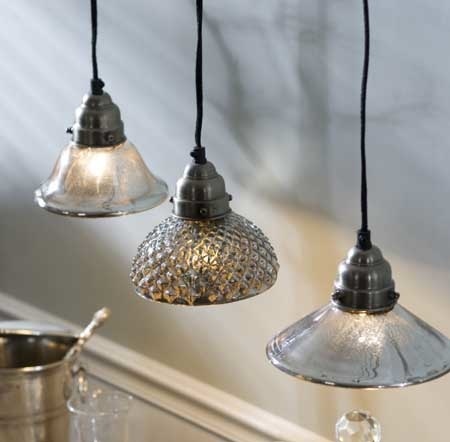 and i love the light fixtures you picked out, they'll be a gazillion times prettier! This looks great! I rent, also...so I understand the desire to make it "yours." I need to do a few things around my place, too. Thanks for sharing!